It's all about Gift Wrapping! From December 2nd - 9th, the Creations by AR Design Team is sharing ideas for presenting holiday gifts using four new templates from Creations by AR! Be sure to join us daily on the Creations by AR FaceBook Page, so that you don't miss any of the fabulous projects! Continue reading below, to see how you can enter to win one one of the Creations by AR Templates I'm showcasing on my blog today! Today, I'm showcasing three of the new templates, all projects use the Bo Bunny Silver & Gold pattern paper collection, and were cut using the Silhouette Cameo. These fabulous template are also available as PDF Files for those who might not yet own an electronic cutting machine. If you are using a Silhouette Machine to cut your projects, be sure to see Adela's You Tube Video on how to Resize your SVG Files and View Score/Cut Lines. 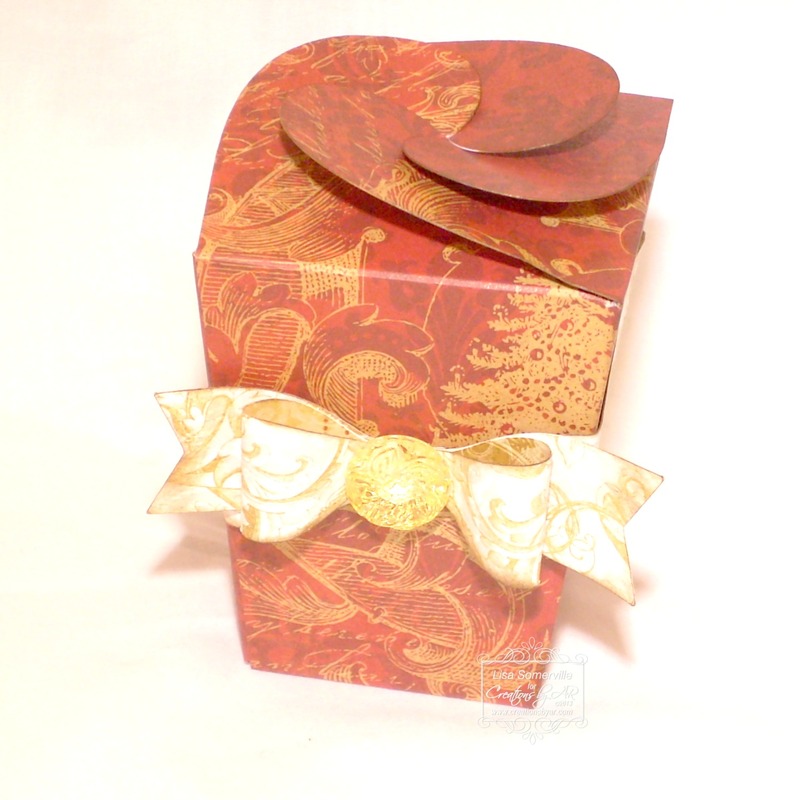 While I loved the larger size of the Gift Tower Box, I opted to reduce the size of the files using the Silhouette Software, and created a miniature version that's the perfect size for a Christmas Ornament. I adhered all pieces with Scor-Tape, then pieced a hole in the center of the small box lid and added an ornament hanger. 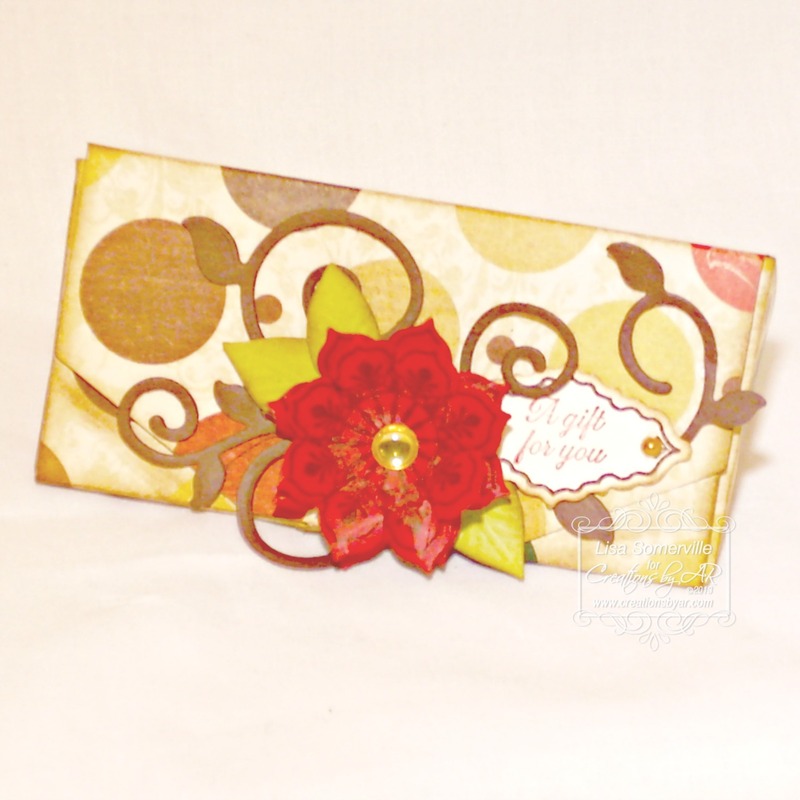 To embellish the box I added Vintage Brown Seam Binding a Prima Poinsettia and a small tag stamped with a sentiment from Our Daily Bread Designs Ornate Borders Sentiments stamp set. I love this Swirl Top Box, and can see it filled with small gifts, gift cards or candy! To embellish the box I added a paper bow using the It's Bow Easy SVG File, embellishing the center with an acrylic button. My last project features the Triangle Compact. This box is super easy to assemble, and like the Swirl Top Box would be perfect filled with candy. To embellish my Triangle Compact Box, I added a stamped/die cut flower using Our Daily Bread Designs Ornate Borders and Flower stamp set, die cutting the flower using the ODBD Custom Ornate Borders & Flower Die. I added leaves and a swirl using the ODBD Custom Fancy Foliage Die, and a stamped tag using the Ornate Borders and Flower stamp set along with the Ornate Borders Sentiments and ODBD Custom Orante Borders & Flower Die. By changing out your papers and embellishments these new box templates are perfect for any occasion! The other new template available this month is the Our House Gift Tag. You can purchase these templates separately here, or you can save money by purchasing the December Bundle which includes all four new templates! DAILY PRIZE GIVEAWAY: To enter to win, simply leave a comment on this blog post, letting me know which of the new templates is your favorite. One random winner will receive one template of their choice, from the new templates shown here on my blog! The winner will be announced tomorrow December 5th, here on my blog, so be sure to check back! 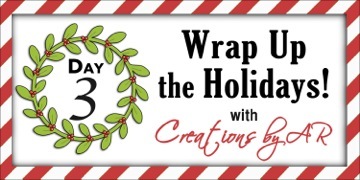 Be sure to stop by Lori's Blog tomorrow for another chance to win one of these new templates and to see how she is wrapping up the holidays! If you missed the projects created for Day 1 and Day 2, you can see what Patti created here for Day 1, and what Jak created here for Day 2. These are just fabulous. I love those gift tower boxes. I love how you reduced the sizes of your stacked gift boxes Lisa! SO cute! The papers you used for all of your projects is wonderfully festive for holiday gift giving! Cute as can be, Lisa! I love seeing these new templates all created and embellished! Great job!!! 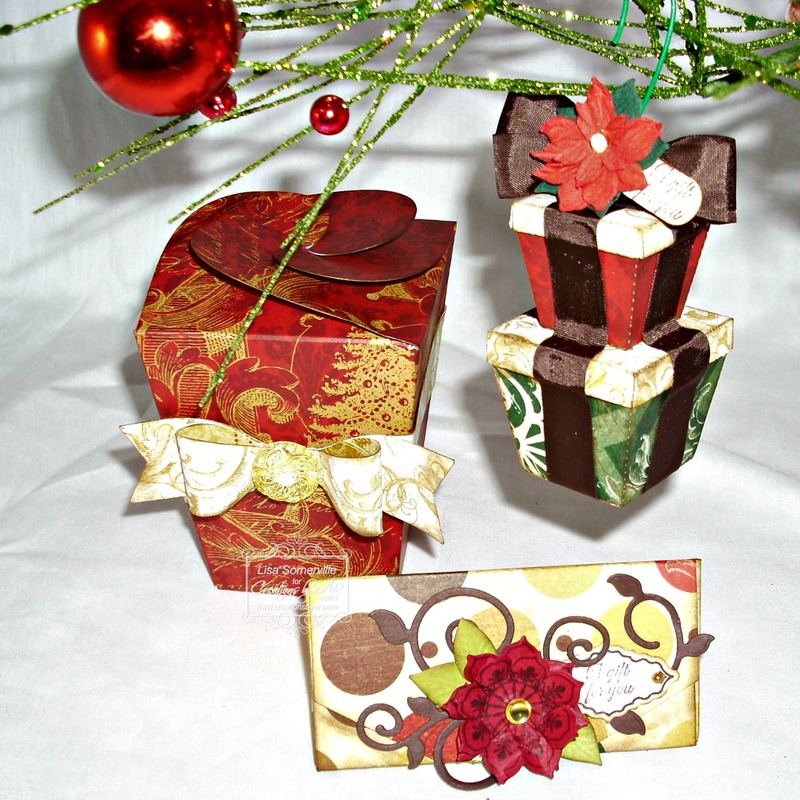 Love the idea of making the tower boxes into a tree ornament. Wonderful projects. Like the colors you sued. The triangle compact is my favorite. Superb, you never fail to impress me, love the papers used. Love, love the small boxes ornament Lisa! All your projects are terrific as usual! How very clever to make a gift tower! Love it. The button on the bow adds a touch of glamour...so sweet! Thanks for the great ideas. You've done a wonderful job with these. Difficult to choose a favourite, but I think it might be the Swirl Top Box. Fab choice of papers too. How clever of you to re-size the gift box tower, Lisa. They would look so sweet on my mom's smaller tree as ornaments. Thanks for the idea! Your projects are very beautiful! 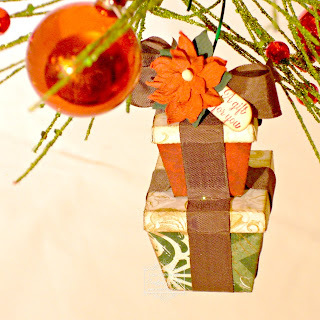 What unique ways to wrap up small gifts and make them look delightful. It is hard to choose a favorite as they are all so great but I would have to say the swirl top box is my favorite! Thank You for the opportunity to win a template. Love all that you did with the different templates. The tower boxes are wonderful. I love that you can re-size them and use them in so many different ways. Love the papers you used. Everything is so nicely done and looks absolutely beautiful. Thanks for all the ideas. Cool tower boxes Lisa! Love that these can be re-sized and customized for everybody. Love your gift box tower ornament Lisa...would make for a super surprise for sure. Lovely papers on your other projects-very elegant!!! I will have to try some of these ideas for gift giving! I love that triangular compact. I think there would be a ton of uses for it. Oh, what gorgeous boxes! I love the swirl top box especially!